I will admit to a strong bias in favour of face-to-face learning with Twitter colleagues at an actual event. Twitter conversations last night with Rodd Lucier (@thecleversheep), Brenda Sherry (@brendasherry), and Peter McAsh (@pmcash) reinforced for me that a significant effect of #edCamps and other such gatherings is the opportunity to converse with educator colleagues and friends between the sessions. It’s difficult to replace that in-person presence. Having been involved in the organization of #edCampQuinte (3 camps back in 2011), and having attended #edCampToronto (twice), #edCampWR (twice), #edCampOttawa, (as well as following the original #edCampPhilly remotely via Twitter), I’m firmly convinced that in-person attendance is the ideal way to go. However, knowing that I would be attempting to follow the conversations and the sessions from a distance, my efforts switched to looking for a variety of ways to capture experience and the discussions occurring within and via the ether of the Internet. 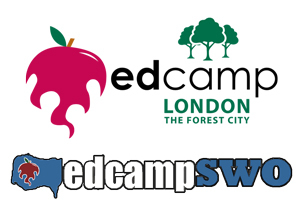 The first step in my adventure was to create a couple of columns in my TweetDeck Twitter client to follow the #edCampSWO and #edCampLDN hashtags in real-time. In support of archiving the conversations for later review, I also made use of Martin Hawksey’s (@mhawksey) ever-evolving TAGS google-spreadsheet-scripted-visualization tool. Not only does the tool create a spreadsheet of archived tweets from a given #tag, but it also allows for the creation of an interactive and continuously updated visualization of the participants and their conversations. The static screen capture above doesn’t do the clouds justice. Click below to view the actual dynamic interactive archives – they’re amazing! Because the schedules at most #edCamps are participant-generated in real time from grass roots interests during the events themselves, a pre-posted schedule is usually avoided. Normally, the session board is compiled following a crowd-sourcing exercise involving either sticky-post-it-notes or whiteboards. 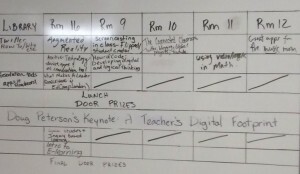 A quick check of the #edCampSWO twitter stream led to an already tweeted picture of the initial board from Tilbury. Not only was the #edCampLDN schedule posted online, but each entry included a link to a blank gDoc for collaborative note-taking! Great thinking! I quickly paged through and pasted in a request to each document to capture the name and twitter handle of the session facilitators for later followup. But what about #edCampSWO? Surely such a system might provide useful for collaborative note-taking there as well? What was required to support a similar opportunity there? Transfer the #edCampSWO session board to a gDoc. 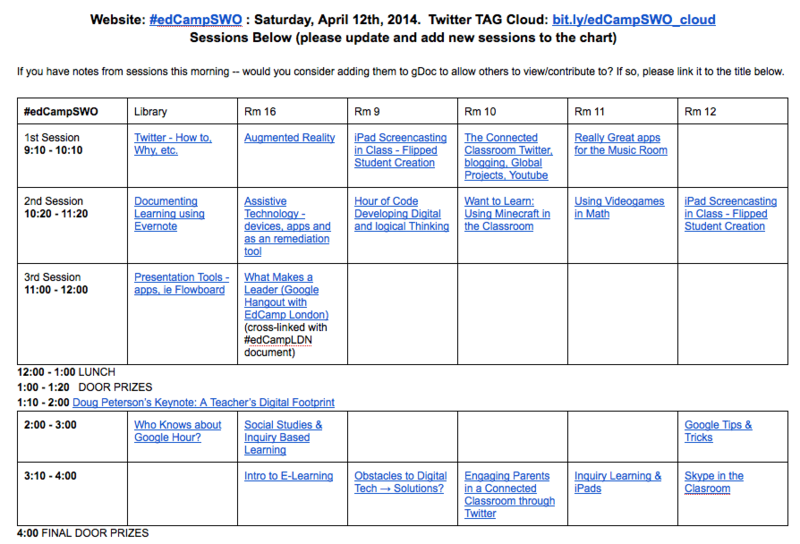 Create linked gDocs (with requests for session facilitators and their @twitter coordinates) for #edCampSWO sessions. Tweet out invitations for the #edCampSWO participants to post their notes in the appropriate documents. By 12:30 pm I had followed through with steps 1-3 above, and by 1:00 pm had incorporated the recently-added afternoon entries to the schedule and and linked gDocs for the remaining sessions. Shortly thereafter there were responses from Michelle Korda (@KordaKovar), Emily Fitzpatrick (@ugdsb_missfitz), Michel Grimard (@miche4195), Brian Aspinall (@mraspinall), Mary Alice Hanson (@Ms_Hanson) expressing interest in the shared note-taking endeavour. The invitations stands for any and all attendees at #edCampSWO to transfer your notes, links, thoughts and ideas into the shared note files. #edCampSWO had a post-lunch keynote by Ontario’s “Grandfather of EdTech” Doug Peterson (@dougpete). As it turned out, the keynote was shared from #edCampSWO to #edCampLDN via Google Hangout, and so the opportunity for shared note taking between both venues was enhanced — as well as providing an opportunity for me to join in and see Doug’s presentation. As it would turn out, the notes in the gDoc are mostly mine. 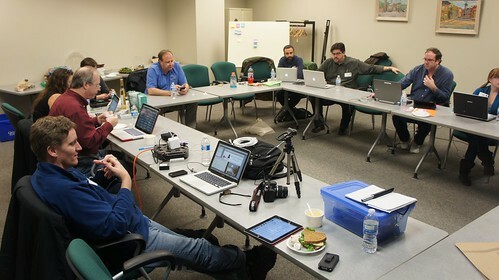 It was nice to connect briefly with #unplug’d12 friend James Cowper (@cowpernicus) who set up the Hangout, and to bring in #ECOO and #edCampQuinte colleague Peter McAsh (@pmcash). These are all some folks I would have been catching up with F2F, had I actually been in either Tilbury or London today in First Life. After Doug’s keynote, I again re-issued the invite for folks at #edCampSWO to collaborated in the shared notes, and then went back to monitoring the Twitter stream. At around 2:30, a few spammers started to join in the #tags, which prompted a question in the stream as to whether the #edCamp conversations might be trending. Trending conversations attract these silly spambots. Conversations in Other Online Spaces? Earlier in the day (at 10:48 am my text document indicates) I noted to myself that I tend to monitor things from the Twittersphere for the most part — and I wondered at the time if there were #edCampSWO and #edCampLDN conversations going on via other networks — Google+ and Facebook specifically. 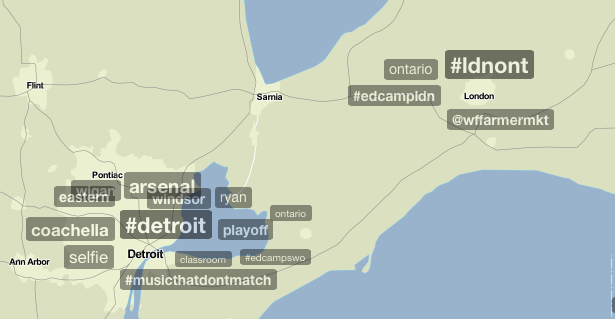 At around 4:00 pm, as the #edCamp goodbye and thank-you tweets were flowing, I looked in on both the other two networks and did searches for both of the Ontario #tags. So, No. Real-time conversations tagged with #edCampSWO and #edCampLDN were essentially only happening within the Twitter online space. Not a real surprise, as Twitter has been extremely effective among those Ontario Educators who have embraced social media over the last half-decade. Google+ was kind of late to the party, and Facebook tends to reflect a more personal, rather than professional focus. So. What DID I Learn Today? Tracking #tags is a great way to gather information from afar (people, links) for subsequent followup. Most of the conversation during and about the sessions occurred in the Twittersphere, not Facebook or Google+. Shared, collaborative Google docs present a wonderful, as-yet mostly-untapped potential for collaborative learning. Gathering/Curating/Sharing a list of subsequent reflective blogposts from #edCamps to continue the conversations is often only a serendipitous effort at best. Future #edCamps might wish to promote a shared, online schedule and note taking function like #edCampLDN modelled today. Getting folks involved in advance and having some folks working behind the scenes to support and facilitate the note-taking. Have one audience member sit up front and share each session via a Hangout or livestream as an option for those who can’t attend. It is easy enough to do today with the wonderfully accessible technology existing today. Select dates for #edCamps in conjunction with other organizers to allow for some potential cross-#edCamp sessions — but also consider scheduling events within the same area on different dates to maximize the opportunities for F2F participants to attend both. 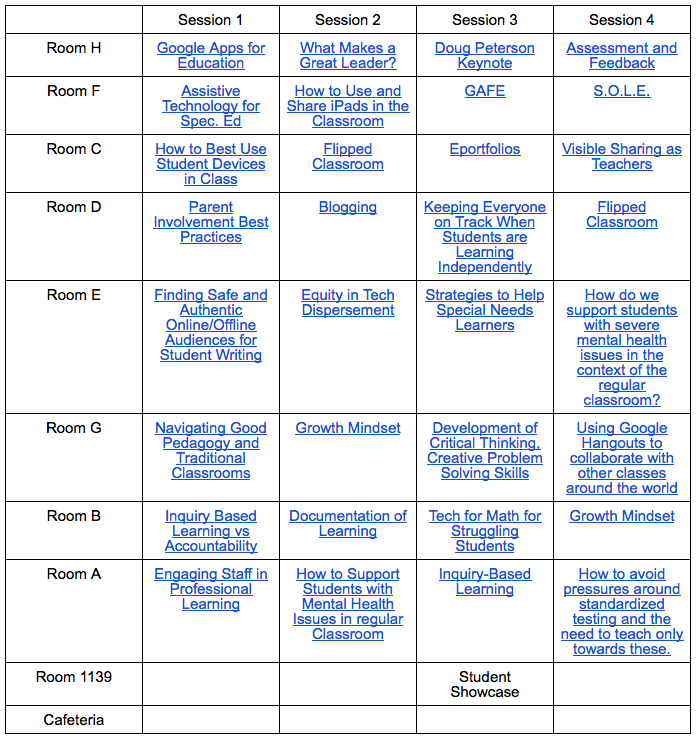 (The next two upcoming Ontario #edCamps also scheduled for the same day — May 10th: #edCampSault in Sault Ste. Marie and #edCampIsland on Manitoulin Island.) Note that there were 9 #edCamps held today around the world — a new record for one day, I believe. Photos! Pictures say a lot, and help others from afar to see the goings on. I enjoy sharing photos from the #edCamps I attend — and missed not being able to capture some of the action today. Consider arranging for one or two attendees to act as #edCamp photographers and share their images via a Flickr set. Encourage attendees to blog and share their reflections and learnings. Find a way to curate the posts to help attendees and others learn from the #edCamp after it is over, and to promote ongoing conversations. Do We All Need a Designated Person-On-The-Ground? Or Can We Be That for Each Other? I recall with fondness asking tweeps Danika (@DanikaBarker) and Zoe (@zbpipe) and Doug (@dougpete) to act as my personal Advance-ManPerson-On-The-Ground in their respective parts of Ontario to keep an ear to the ground for the as-then-yet-unannounced dates of opening for new Apple Stores. That’s another story, but the idea of having someone working with you in another location is a powerful one. It would be a difficult task to line up individuals for all the various sessions happening at a distant event (especially when #edCamp attendance and session topics are determined rather more spontaneously than other conferences) — but the idea of a collective, collaborative shared Team-On-The-Ground acting collaboratively for others is a powerful one. It would be wonderful to see this become yet another characteristic of the evolving, grass-roots #edCamp experience. In the interests of helping to aggregate posts that come from today, these Google forms may come in handy. Please consider sharing your thoughts and your learning! Sounds like a very busy day for you, Andy! I remembered about both #EdCamps half-way through my Rotary event today. Let me know when the next one is and I’ll try and get there! Well, I like the idea of attending #edCampIsland up on Manitoulin in May. Just checked the schedule and it looks as if the Chi-Cheemaun starts running the weekend before, so that might make travelling a viable option, weather permitting.